What do you need to do to sell your wedding dress? bridesmaid dresses and all things bridal on our website for viewing by potential buyers. Reach our entire network of brides-to-be. More clicks, views & buyers. For dresses and Mother of the Bride/Groom. €5 for accessories and Flower Girl/Page Boy. Advertise to our network of brides to be. To list your dress on the website, choose “Regular” or “Premium” advert and click on the ‘Start Selling’ button. Complete the Dress Form with all your dress details. Using the picture upload function you can upload your pictures direct to the site. If you would like your faces cropped out before uploading to the website you can e-mail your pictures to info@sellmyweddingdress.ie, we will crop and/or edit your pictures and return them to you for upload. We are also happy to create a website listing for you, just email us your dress details and pictures and we will do the rest. When choosing pictures for your listing please ensure they are of high quality and show your dress at its best. Please do not use images if you do not have permission to. If in doubt contact us and we will advise you. We ask sellers to supply 4 pictures taken from different angles, front full length, back full length with train extended and close ups of any special feature or detail. Please ensure the images your are uploading do not contain personal details on the file name, ie your full name. When a buyer is interested in your dress, they will use the ‘Contact Seller” link to ask you more information about your dress or to arrange a viewing. You then contact the buyer by sending an e-mail or by phone if they leave a contact phone number. Buyers do not see your contact details until you contact them. Please let us know when your dress sells so we can remove your dress from the website and ensure you stop receiving e-mails from interested buyers. We accept Once Worn/Once Loved, Ex Sample & New Wedding Dresses, Bridesmaid Dresses, Flowergirl, Pageboy, Accessories, Mother of the Bride & Groom and Special Occasion Wear. With a premium listing option your dress will be featured on the website homepage for approximately 30 days and at a minimum 28 days. Any enquiries/e-mails sent to website subscribers for the purpose of solicitation will be deleted. Any enquiries/e-mails we deem to be a scam or fradulent will be deleted. You should give as much detail as possible about your wedding dress. Size your dress accurately, for example, if your dress was a size 14 when you bought it, you will need to include this information under ‘Alterations’. Also if your dress has any marks or damage these should also be listed under the dress description. Second hand/once worn designer wedding dresses on sale prices will be approximately half their original price. This pricing rule would be based on the dress being recently purchased, in excellent condition and have been professionally cleaned. 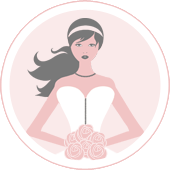 Trending wedding dresses in Ireland which are unworn/unaltered/new, with tags attached, will have a higher value and your asking sale price should reflect this. If you in doubt as to what price to put on your dress, have a look through the dress galleries and compare your dress to similar dresses. Also feel free to contact us at info@sellmyweddingdress.ie and we will be happy to help you. You can upload your pictures straight onto the website, through the ‘Sell My Dress’ link or if you prefer you can e-mail them to us at info@sellmyweddingdress.ie and we will upload for you. We will re-size and edit pictures where necessary. Please ensure to let us know if you want your face removed from pictures. All items listed for sale must have an accompanying picture. It is our policy not to display items without a picture. We reserve the right not to display pictures we deem unfit or unsuitable. Submitted pictures should not depict dresses or items owned by other people. Please be vigilant with your personal details and especially your bank details. Do not give it to potential buyers as well. Beware of suspect inquiries. Establish a relationship with an interested buyer and offer to meet them face to face. A genuine buyer should agree to meet and want to see the wedding dress in person. Beware if they are reluctant to do this or ask you to post on the dress. Only accept cash, and use a counterfeit pen if you have one. Only accept payment by cheque if you can hold onto your dress until the cheque clears. Payment should be for the exact amount you and the buyer agreed on. If the buyer seems odd in any way or out of the ordinary. Male buyer, buying for his daughter, fiancée etc. This is not normal practice. A buyer offering to pay more than the asking price. This scam involves the buyer giving you a cheque for more than the asking price and asking you to give them the difference as cashback. Use common sense. If something sounds too good to be true it probably is!